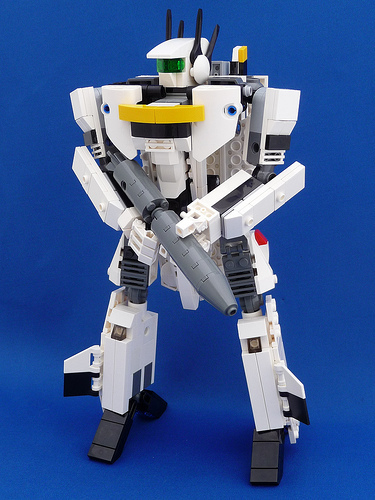 If I were checking out TBB right now, I’d probably think something along the lines of: ‘oh no, not another mecha!’ However, my excuse for blogging this model by daikoncat is that this is not just any old mecha; it’s the Skull Leader from the Macross saga. I used to watch the series as a child (although I knew it as Robotech). In fighter mode, the Valkyrie resembles the F-14 Tomcat and the Skull Leader’s markings are obviously based on the US Navy’s ‘Jolly Rogers’ squadron. As a big Tomcat fan and a big fan of the Jolly Rogers, I loved it and I love this model. 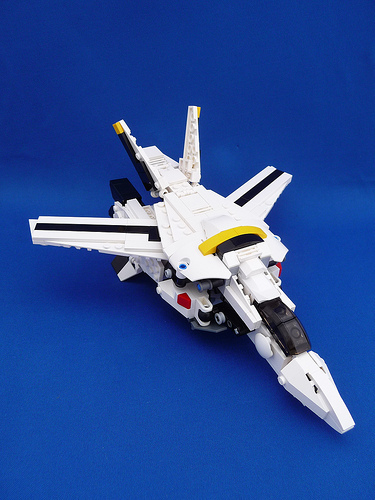 This is not the first Valkyrie we’ve blogged, but it does look super-poseable. Mecha don’t get much cooler. Roy Focker’s VF-1s! Instantly recognizable and it does look very posable, even at the scale it’s in (looks about 1/60 ;) ). Looks like the transformation scheme is an exact match to how the regular ‘Perfect Transformation’ toy models transform. Nice to see the FAST-packs in diakoncat’s photostream as well.